Complete the form to download the MBA brochure. You may qualify for a GMAT/GRE waiver. Find out today. Develop a global mindset. Instill social responsibility. Improve your world. From the growth of the global economy to the need for corporate social responsibility, businesses need to ensure you have the latest in quality education to help take their companies and teams to the next level. 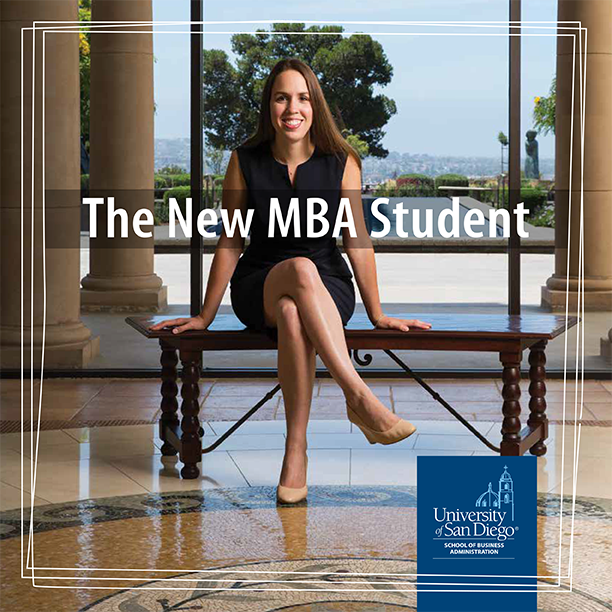 With a part-time MBA from the University of San Diego, you will have the opportunity to receive a personalized education from faculty that really care to see you succeed and study in a room full of industry leaders. Our professional MBA offers two formats: evening courses and hybrid courses. You can complete either option in as little as two years. And for the ultimate flexibility, you can mix and match class formats after you finish your first semester. Whether you choose our evening or hybrid format, we'll help you become an agent for change. Looking for a top ranked education? USD’s MBA programs consistently rank highly by Financial Times, U.S. News & World Report and other publications for their real-world studies, life-changing experiences, alumni success, faculty research and student-centric academic experiences. Small cohorts - of 20 students on average - allow you to interact with our expert faculty and develop career-changing network connections. Looking for flexibility? Earn your MBA at your own pace and on your own schedule. Students can choose between two flexible options: all evening classes on campus or a hybrid program consisting of 60% on campus and 40% online -- and they can mix and match these options after their first semester. Looking to dive deeper into one area of business? Our program allows you to choose a concentration based on your specific interests and needs. Some options are: corporate social responsibility, entrepreneurship, marketing, finance, supply chain, managerial leadership and international business. Looking to really excel in your field? Explore our dual degree options: MBA/JD, MBA/MS Real Estate, MBA/MS Supply Chain or MBA/MS in Finance.